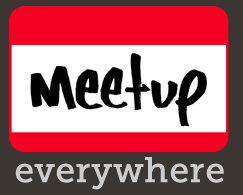 Meetup Everywhere: Turn Your Followers Into A Real Movement. And Celebrate Our Bday! Today at TechCrunch Disrupt in New York, Scott Heiferman, the CEO of Meetup showed off his newest product with potentially big real world ramifications: Meetup Everywhere. Meetup, an online way to establish real world meetups, has seen success with its core product. There are now some 50,000 meetups a week going on almost everywhere in the world thanks to the service, Heiferman says. But Meetup Everywhere is a brand new platform — it creates an easy way for an organization, company, or movement to spark a meetup simultaneously anywhere, not just in one location. As you might expect, TechCrunch is a launch partner for the product. And we’re using it for a good reason. On June 11, TechCrunch is celebrating its 5th birthday. We have a birthday party every year, but it’s always limited to some place in the Bay Area. Now, those people who wish to celebrate as well but can’t make it to the Bay Area, can host their own gatherings around the world. And we can track them all through Meetup Everywhere. 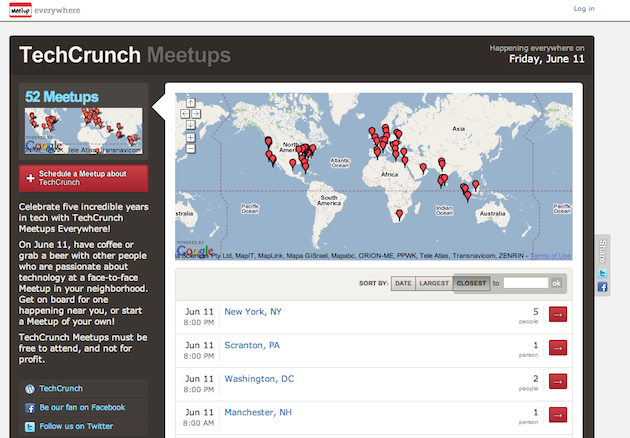 There are already TechCrunch birthday meetups set up in 52 cities around the world. Hopefully we can send out some stuff to help celebrate. And there are 14 other launch partners for this platform. They include VC Fred Wilson, author Seth Godin, Foursquare, and the Huffington Post.